Not being ADA compliant could cause you to fail a city or county inspection. 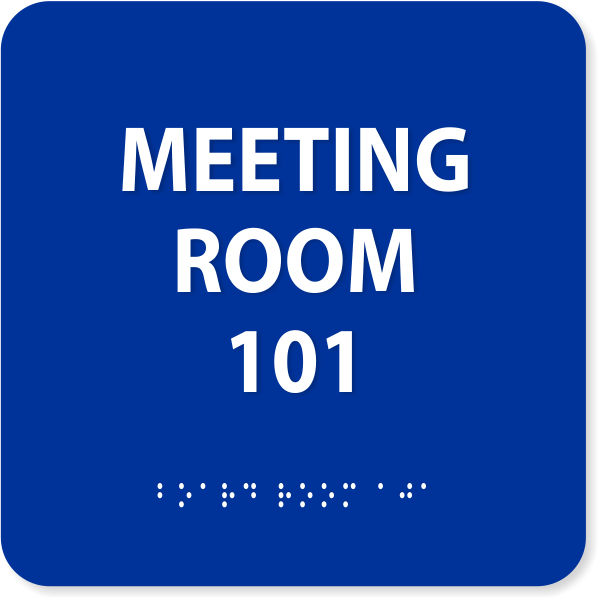 With this Meeting Room Sign with Raised Letter & Braille, you can add up to 3 lines of text for each of your meeting rooms. Utility Room Icon Acrylic Print Sign - 3" x 10"
Square Corner Full Color Wall Sign with Plastic Holder - 2" x 10"
Custom Text Room Name and Number Acrylic Print Sign Wave - 3" x 10"
Please Use Other Door Oval Contour Cut Decal 3" x 10"
Display this ADA compliant Meeting Room Sign with up to 3 lines of customization near your meeting rooms. Several sizes available. Letters are raised & braille will be added to complete your handicap requirements. Several engraving colors are available. For a long list of wayfinding signs, you can put your quantity in and upload a file with your list of rooms & numbers & we will be glad to set them up for you. Your satisfaction is our #1 priority. Most orders ship the next business day, however if you have several signs to be made, please note a longer ship time.